Prominent players in the global wind power coatings market comprise Hempel Fonden, Teknos Group Oy, 3M Co., PPG Industries, Jotun Group, and Akzo Nobel N.V. These companies are increasingly focusing on developing wind power coatings using materials that are eco-friendly to strengthen their hold in the market. They are also engaging in strategic mergers and acquisitions to gain a leading position in the global wind power coatings market. As per expert analysts, the global wind power coatings market is anticipated to grow at a 12.3% CAGR during 2017 to 2025. It is perceived to reach the valuation of US$ 80.11 mn by 2025. In terms of applications, the onshore segment dominates the wind power coatings market. This is on account of rising demand for these coatings in wind farms. Additionally, the polymer coating segment is expected to grow at a promising pace owing to excellent corrosion resistance. Regionally, Asia Pacific leads the market owing to rising investments in wind power sector from India and China. Owing to rising environmental concerns, there is an increasing demand for renewable energy sources. Consequently, there has been a rise in the number of wind turbines leading to an expansion of the global wind power coatings market. Additionally, the rise in need for the maintenance of wind and photovoltaic systems as fueled the market’s growth. 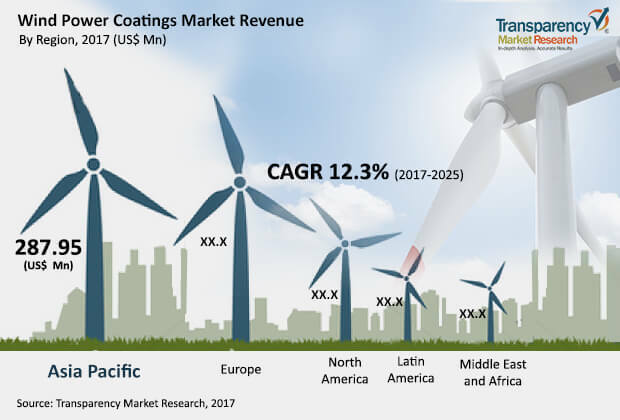 The ease of application of wind power coatings has also boosted the global wind power coatings market’s expansion. Moreover, there has been a rise in investments in the wind power sector in the emerging economies. This has given a thrust to the production of wind coatings as they are needed to maintain sustainability of the wind turbines. This has played a key role in propelling the global wind power coatings market. In addition to this, the stringent regulations laid down by the government pertaining to maintaining the ecological levels has promoted the market’s growth. Further, the advancements in the global wind power energy market has created new avenues for the global wind power coatings market. The focus on reduction of maintenance costs will also ascend the growth of global wind power coatings market. In addition to this, an easy availability of feed stock will propel the market’s growth. There are a few restraints that may hinder the global wind power coatings market’s growth. Factors such as higher investment may thwart the market’s growth. Nonetheless, the new innovations and research will subside the effects of the restraints. For instance, an environmentally friendly coating developed by Colorado State University researchers offers sustainability along with ice repellence. Moreover, numerous companies are developing fire protection coatings as offshore wind turbines are prone to fire. The fire protection coatings developed by AkzoNobel offer jet fire protection along with cryogenic spill protection (CSP). These developments will surely serve as a landmark in the global wind power coatings market and present new opportunities for its growth. The study presented here is based on a report by Transparency Market Research (TMR) titled, “Wind Power Coatings Market (Type - Polymer Coatings, Metal Coatings, and Ceramic Coatings; Application - Onshore (Onshore Blade, Onshore Tower, Onshore Interior) and Offshore (Offshore Blade, Offshore Tower, and Offshore Interior)) - Global Industry Analysis, Size, Share, Growth, Trends, and Forecast 2017 – 2025”.